I drew this in 2012. A long, long time before they got canon cutie marks. Also I stopped watching the show after I hated Season 3 so I honestly don't care at all about their canon Cutie Marks. I've seen many ideas of what their cutie marks will look like and this is the best so far, Applebloom's is my favorite! This is really cool! I love their cutie marks!! Would it be alright if I used this in an analysis video that I'm doing? I suppose that's okay, but Sweetie Belle (and her cutie mark) are out of date with my current design. SMILE!! ITS A FAMILY PICTURE!!! Sweetie Belle: YAAY do i look stylish enough? chris: yes your a movie star! pinkie will help me with the photo! Ab: umm why? Chris: because she will do something funny to make you smile! Scoots: umm ok.. Pinkie: OK SMILE!!! *all the cmc smiles* Pinkie: SWEETIE SMILE LARGER!! Chris: its to late i already took the pic. Pinkie: oh.. okey dokey..
what their marks mean in this case? How did you know their real cutie mark? I didn't, I made it up. i haz ad dis to favs! they look as adorable as ever!!! 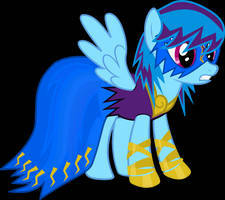 the cutie marks are perfect! I hope that will be what they look like in the series when they grow up. I hooe the fans don't find it too predictable or boring if they do because this does seem possible. Wow, you made this really amazing! 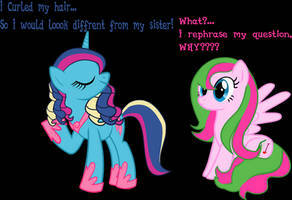 How did you come up with the cutie marks?? ow aw THERE IS NO WORDS! Ummmm. This is kind of awkward; but I'm kind of planning on doing an FIM fan series on day (hope you don't find it disrespectful of me to talk about this on one of your drawings), and my idea for Sweetie Belle's cutie mark is exactly what you've come up with (although I was inspired by something, though there's a chance that you may have been inspired by the same thing?) and while I have yet to come up with an exact design for Scootaloo's what you've got is pretty much what I was going for (though it may not look exactly the same). So what exactly should I do here, should I think of something else? I will admit I'm still struggling on Apple Bloom's cutie mark (which is ironic seeing as she appears first in my series) but I will make sure it's nothing like yours. That aside this in awesome drawing of the CMC - I love how you've designed them. Sorry to babble on about myself on your drawing like that. I based my Sweetie Belle Cutie mark off her cutie mark in G3 and G3.5. For Scootaloo, I just made something up, with some suggestions from my BBBFF. I don't care if the ideas are similar, I mean, we basically know what their talents are, so some cutie marks designed fro them can be similar. Oh, and thanks. Thanks, I'm pleased that you are okay with it. Thanks for understanding. I was inspired by G3 for Sweetie Belle's cutie mark too. I wasn't sure if that's where you got the inspiration from, so I waited. My fan series is going to follow FIM, but because I love all generations, it will contain things from previous generations too ranging from simple "Wait, haven't I seen/heard that before?" moments to actual character appearances. I thought that semi-reusing Sweetie's G3 cutie mark (but making it more "musical") could be one of the former examples (and she makes more sense than Scootaloo). I love love love how Applebloom's cutie mark is a pallet that looks like an apple. 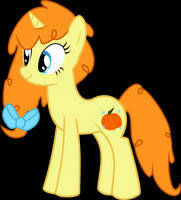 Ooh, that apple palette is a great idea for AB's cutie mark! Apple Bloom's staring into my soul. They still look cute! Even as young adults!